Sisters, family and guests gathered today to witness the reception of Krista Ferrell, Marena Hoogland and Mary Ruth Kayute into the novitiate. 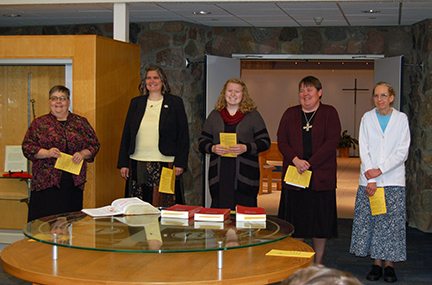 With smiles, happy tears, singing and celebration, we joyfully welcome these wonderful women as novices. Prioress Sister Nicole Kunze shared with the novices, "We welcome you as our companion in this, our life of prayer, lectio and service. We thank God for stirring up this call in your heart." Please pray for our new novices, and our monastic community, as we deepen our commitment to God, community and the Benedictine way of life. May we, "Prefer Nothing Whatever to Christ."